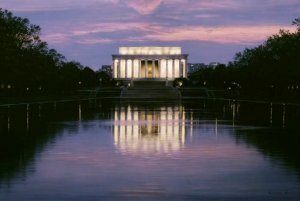 The Lincoln Memorial is one of the most beautiful and dramatic monuments in the city, but it is difficult to construct a strong composition with it as the focal point because of where it stands. In this piece, Chase approached the composition “from the water” rather than from the land as in A Grateful Nation. The exquisite sunset and the warm glow of the memorial itself reflect in the dark water creating a sort of mirror image effect. And, in fact, the glow of the lighted memorial can be likened to the warm feelings so many Americans have for Lincoln himself.